Junkaroo festivities in the Bahamas. Existential and humanistic psychology has struggled in is embrace of diversity (see Hoffman, 2012, for an extended discussion of this topic). Yet, there is hope that change is coming. The first vital step was working to gain widespread acceptance that diversity is an important topic worthy of consideration in existential psychology. Increasingly it seems evident that a growing majority of people in existential psychology have accepted this. Next, it is vital that increasing depth be cultivated around this topic. Becoming diverse must be about more than bringing people from different backgrounds and different forms of diversity to the table. It is necessary to bring their experiences, their ideas, their symbols, their myths, and their language into the discussion. Symbols have long been treated with reverence in the depth psychologies, including existential psychology. Symbols capture complex, concentrated forms of meaning while myths weave together meaningful stories comprised of multiple levels of symbols. The power of symbols and myths, in part, lies in their ability to be concurrently highly individual and yet universal. As such, they represent our paradoxical and complex nature. Romantic myths, such as Romeo and Juliet, represent a universal theme of longing for relationships and connection. However, the way the particular myth plays out is very culturally laden. Yet, as the Romeo and Juliet myth has been interpreted and reinterpreted over time, it has been adapted to different cultural realities. In this way, the story is able to dance in the world of the universals while remaining culturally grounded. Existential psychology, since its inception, had been overly reliant upon a narrow mythology, that of Western culture. Even more, despite some early discussions of the Greek myths, existential psychology had largely taken on the myths, language, and values of northern European and United States culture. A broadening was needed. I would like to reflect briefly on four different expansions of the existential language and symbols that I believe to be very significant, even if only beginning to receive the attention they deserve. Wang’s (2011) article introducing the concept of Zhi Mian (i.e., to face life directly) was an important step. Of the four I will discuss, Zhi Mian has received the most consideration to date. As Wang notes, it is difficult to translate Zhi Mian because there is no parallel in English. It combines various existential themes such as self-awareness, courage, and authenticity into a single concept. It calls upon one to authentically, courageously, and honestly face directly oneself, others, and the world. Dallas, Georganda, Harisiadis, and Zymnis-Georgalos’s (2013) recent article in the Journal of Humanistic Psychology serves to reintegrate some forgotten Greek philosophy. They compare the Greek concept of oistros to zhi mian. The origins of the term oistros comes from the female reproductive cycle, but also combines a feeling of “exhilaration and inspiration” (p. 254) as well as an annoyance, such as a gadfly, that arouses and infuriates. Similar to zhi mian, this is difficult to translate because it combines several levels of meaning. Yet, it can serve to inspire and motivate people to change and growth. Chan (2009) focuses on the concept of harmony, particularly being in harmony with the sky (or universe), from a Chinese perspective. This example is particularly poignant as existential psychology has often focused much more on the individual than the collective. Yet, Chan illustrates that the individual and the collective are constantly holding a tension; they are two aspects of our paradoxical nature. If we consider the individual, but do not consider the universe, culture, or harmony, we are not dealing holistically with a person; we are not dealing with one’s complete existence. Cleare-Hoffman’s (2009) analysis of Junkanoo, a Bahamian festival, includes several poignant implications for existential psychology. First, she maintains that reclaiming the meaning of this festival may be healing at the cultural and individual level for many Bahamians. Additionally, she discusses how the festival of Junkanoo, which began when the Bahamians were held in slavery, is paradoxically an expression of freedom under the conditions of slavery. 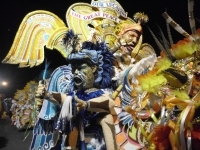 The symbols common in Junkanoo costumes represent many uniquely Bahamian meanings. This festival illuminates culture-specific experiences of the universal given of freedom. I discuss these four important articles in brief partially because of space and partially to encourage readers to pursue the original works, which are more powerful and important than I could convey in a brief article. When we approach these symbolic representations of wrestling with existential issues we accomplish many important tasks. First, we move toward a more inclusive existential psychology that accepts and embraces different ways of understanding and being existential. Second, through sharing symbols, myths, and experiences as they relate to the existential givens across cultures, we deepen our understanding of these existential issues. Having been deeply engaged in existential psychology for many years and having read the majority of the texts written by the early existential psychologists, I find myself increasing drawn to the cross-cultural works. The four articles that I discussed in this blog are among the readings that have most deeply impacted me as an existential psychologist in the past five years. Though in many ways these articles deal with concepts that I have long been familiar with, they do so from a different vantage. They bring a freshness and vibrancy to existential psychology. They challenge me to think differently about ideas that I write, speak, and teach about. If existential psychology is to advance, we need to embrace these cross-cultural exchanges at more than a level of interest; we need to let them transform our understanding and experience of existential psychology. Chan, A. (2009). In harmony with the sky (tian, universe): Implications for existential psychology. In L. Hoffman, M. Yang, F. J. Kaklauskas, & A. Chan (Eds. ), Existential psychology East-West (pp. 307-325). Colorado Springs, CO: University of Rockies Press. Cleare-Hoffman, H. P. (2009). Junkanoo: A Bahamian cultural myth. In L. Hoffman, M. Yang, F. J. Kaklauskas, & A. Chan (Eds. ), Existential psychology East-West (pp. 363-372). Colorado Springs, CO: University of Rockies Press. Dallas, E., Georganda, E. T., Harisiadis, Z. & Zymnis-Georgalos, K. (2013). Zhi mian and “oistros” of life. Journal of Humanistic Psychology, 53, 252-260. Hoffman, L. (2012, October). Toward a deep diversity in humanistic psychology: Facing our challenges, embracing our opportunities. Society for Humanistic Psychology Newsletter. Retrieved from http://www.apadivisions.org/division-32/publications/newsletters/humanis…. Wang, X. (2011). Zhi mian and existential psychology. The Humanistic Psychologist, 39, 240-246.